In December 2001, my husband and I took our son Christopher on a flight from Seattle to Los Angeles. Chris had Duchene’s Muscular Dystrophy. When we boarded in Seattle, the pilot, Gary, asked if we wanted to show Chris, 15, the cockpit. My husband carried him in for a look. Chris’ face lit up as he told us when he became well he wanted to be a pilot. It made me cry. During our flight the entire crew was great to Chris. When we landed, Gary asked for our address to send Chris a card. Chris was so excited Gary wanted to write to him. Several weeks later Chris received a beautiful card. Pinned to it was a pair of wings. 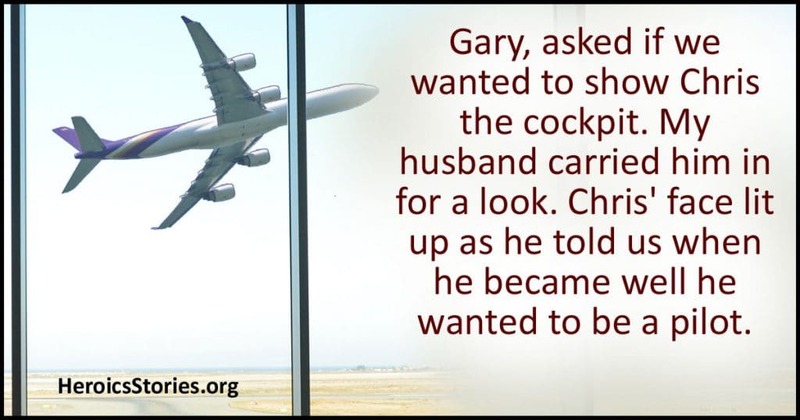 Gary wrote that he’d earned them while in the service and wanted Chris to have them. We put the wings on Chris and he didn’t want to take them off. All he did was talk about the pilot that sent them. He even took them to school to show his friends. Three months later Chris had his 16th birthday. That Saturday there was a knock on the door. It was Gary, who said he was on the way to LA for a flight. He wanted to see how Chris was doing and had a surprise — he’d brought Chris one of his old pilot jackets. Chris was just beside himself. We immediately put the wings on the jacket and took pictures of Chris wearing it. I’d never seen him so excited. The jacket was his most prized possession. Six months later, on August 10, 2002, Chris passed away. We sent Gary an email about Chris’s death, but sadly it was returned. Four years later I found a web page looking for stories about wonderful customer service experiences while traveling on Alaska Airlines. Now was my chance to let the airline know about Gary and what he’d done for Chris. My letter was published on the web site. The next week, I received an email from the airline asking my permission to publish my letter in their upcoming In-Flight magazine. I was honored and thankful that Gary would be recognized for what he’d done. I received a call from Gary two months later asking if he could come over as he had something for me. When he arrived, he opened a box containing a model of a 737 Alaska Airline airplane. There was also a note from Alaska’s CEO thanking me for writing the letter. Gary has since been promoted to Captain. This experience taught me the importance of being kind to one another. My older son became a pilot and teaches flying lessons. He is living Chris’s dream — because of the incredible kindness of one person. I will never forget how Gary made one special boy very proud, and how he made such an impact on our whole family. What a lovely and heartwarming story.